Every plane needs to be maintained, this page has things I've learned or recommend in maintaining an RV. Of course most of this applies to an Experimental aircraft ONLY since the FARs would not permit it on a Certified aircraft — one more reason to build the plane yourself. Every aircraft will need to be jacked up from time to time for various maintenance tasks, especially changing tires and servicing brakes. There are various jacking solutions out there including several varieties of axle jacking fixtures. None of these appeal to me because they don't give full access to remove everything and won't let you remove the gear leg if needed. I have two methods I've been using that work well and both utilize a pair of aircraft jacks I bought used from a note on the local airport bulletin board. Method 1 - Take a bolt with the same threads as the wing tie-down, using a drill and grinder turn the head into a dome that fits into the top of the jack rod, and jack the plane up by the wing tie-down. The dome shape allows for the changing angle as the wing rises. This only works on one wing at a time otherwise the center of gravity would tip the plan over on it's nose. Method 2 - Use the wing jack, with a machined "cradle" of Delrin, to raise plane by the horizontal crossbar between the two gear legs (part of the engine mount). You can use one jack just inboard of either gear leg to raise one side, or both jacks on both sides to raise both wheels. This works because the lift points are even further forward than the wheels. Then of course there's the Tail-Mate for jacking up the tail for all sorts of tasks not the least of which is simply raising the tail to level the sump when changing the oil. I bought this for my RV-8 and kept it for use with the RV-3. It is simply invaluable, required equipment. "Standard" brake fluid for GA aircraft is MIL-H-5606. This fluid has been around forever and works fine, but can be improved upon. MIL-H-83282 was introduced a few years back and is a synthetic upgrade. It performs better in every regard, but of special interest is the flash point. 5606 has a flash point of around 225° whereas 83282 is around 425°. This can be a factor with RVs because there have been several reported cases of brake fires on RVs and some have taken the whole aircraft with it. Do yourself a favor, upgrade the standard MIL-H-5606 to MIL-H-83282: Royco 782 or Aero Shell 31. It is not yet widely available but I bought a gallon of Royco at ACI Lubes Co.
Several builders have done some research and say that MIL-H-83282 is virtually the same as commonly available synthetic ATF found at any auto parts store, Mobil 1 Synthetic ATF for example. They say they have compared specs and that it is virtually the same. I can't confirm or deny this but it sounds worth looking into. Nitrile (Buna N) Nitrile formulations exhibit good mechanical and physical properties. They are resistant to most non-aromatic petroleum-based fluids and gases, and have been used in most industrial, automotive, and off-the-road equipment for many years. Their usable temperature range is -65 degrees to + 225 degrees Fahrenheit. Fluorocarbon (Viton and Fluorel) These versatile elastomers have excellent mechanical and physical properties, and outstanding resistance to aromatic fuels, high temperature synthetic lubricants, and many of the new fire resistant industrial fluids. They can withstand prolonged exposure to temperatures of 450 degrees Fahrenheit in fluid service, and limited exposure to much higher temperatures. Standard MS replacement for the caliper o-rings is MS28775-218. The Viton o-ring upgrade is 2-218V-75 and are available in either black or brown. I used brown so as to be able to immediately distinguish them from the standard Buna N seals. They are available from: Ace Seal Inc in Santa Clara, CA, 408-727-3995. BTW, the brown seals in your RV gas caps are Viton. Champion introduced the "extended tip" (also called "projected gap") REM37BY spark plug back in the seventies when Lycomings were having chronic problems with lead fouling on 100LL fuel. With the tip extended into the combustion chamber further the plugs stay much cleaner and burn more efficiently as well. One engine builder reports that he measured a 7 hp increase on an O-360 by simply switching from standard tip to the extended tip plugs. I've used them exclusively on both of my RVs and have never had even one instance of lead fouling. Bart Lalonde (Aero Sport Power) recommends the Autolite (Unison) UREM37BY over the Champion REM37BY for two reasons: it has a nickel coating on the body that won't rust, and they are typically a couple of bucks per plug cheaper than the Champion. Do yourself a favor, switch to the UREM37BY. As with many things in aviation there are many opinions about which oil is best. After a life time of reading about lubrication in all forms of internal combustion engines I'm a first believer that in almost all applications a multiviscosity oil is superior to a straight weight, including in aircraft. Once an engine has been thoroughly broken in using either of the two semi-synthetic oils, Exxon Elite 20W-50 or AeroShell 15W-50 semi-synthetic, is the way to go. So far my oil consumption appears to be about a quart in 20-25 hours (Hobbs). I made sure I broke this engine in correctly so maybe this fairly low consumption rate is a result of that. Regarding engine break-in, here is the oil change regimen I use. I did not install gear leg stiffeners (see comments here) and did have some wheel shimmy initially in spite of balancing my wheelpants. On the advice of other builders I tried reducing tire pressures, and that helped significantly, but I still had shimmy occasionally — approximately 20% of landings at 10-12 mph (GPS groundspeed). I found that 20 psi was the right pressure for minimizing shimmy with the inexpensive Air Hawk tires that Van's provides. 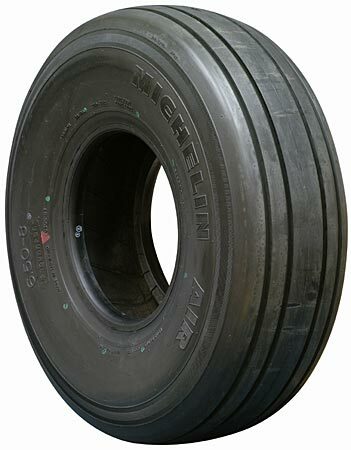 Surprisingly the tires don't bulge out much even at these low pressures, probably because it is a relatively light weight of the aircraft. Although I was able to reduce the shimmy with tire pressures I still wanted to get rid of any shimmy altogether. I admit that when building the plane I did not check for any runout (vertical eccentricity) on the tires when I installed them, nor did I balance them — never had any problem in this regard on my RV-8, but that is a different type landing gear. In an effort to eliminate the shimmy altogether I bought some Michelin Air tires and matching Airstop tubes. So, did they help? The Air Hawks had a small amount of runout, 1/8" on one side and 3/16" on the other. The Michelins are dead true with no perceptible runout. I set the pressures initially to 24 psi and did experience some shimmy at the same speeds as before. On lowering the pressure further to 20 psi the shimmy is now seldom present and less intense when it is. The Michelins do have a more solid stable feel to them but it's not a dramatic difference. In all, I think the shimmy has been reduced to the point where it is manageable. I've learned to minimize it by not using brakes until after I turn onto a taxiway, and by landing smoothly which seems to help. One benefit of the lower tire pressures is that there is noticeably more friction as the aircraft rolls down the runway so I generally don't need brakes until I turn off. Winters in the Pacific Northwest are not as bad as some parts of the country, yet we do have some challenging conditions for a few months of the year. We have lots of gray days with rain and drizzle where the high temp for the day will be in the 40s, but not too many below freezing days. It does get moist in the uninsulated and unheated hangar however. Various steel parts and unpainted tools will rust quickly in the winter due to the high humidity. In order to protect both the plane and hangar contents, and to be able to get the plane started on those cold clear mornings, I've been trying different techniques for several years now. With limited electrical power available, and with wanting to be somewhat environmentally responsible, I was also after techniques that are reasonably energy efficient. Below are the three things I've settled on to cope with the situation. • Hangar dehumidifier — Heating the hangar is simply not realistic (too much energy required, no insulation) so the next best thing is to try to keep it dry. 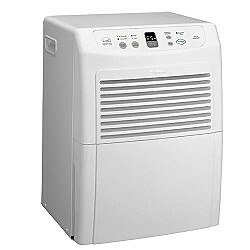 I use a common household dehumidifier to keep moisture minimized. It definitely keeps things less humid to the point where I've noticed only minor rust of steel pieces. When set on "low" it uses about 300w when the compressor and fan are both on and sells for about $179. • Cockpit heater — If nothing is put inside the plane to get it at least a few degrees above ambient temp then moisture condensation is considerable. The interior of the plane can literally have visible condensation on all the metal surfaces... not good! After quite a bit of searching I found the Davis line of heater/dryers when trying to find a solution for my RV-8. 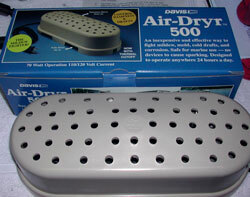 After trying Goldenrods and other devices I discovered the Air-Dryr and tried it and it worked very well. I used the larger round version in my RV-8 but that unit wouldn't fit anywhere in the smaller RV-3 cockpit. I found they also made a smaller version that fits perfectly, the Air-Dryr 500. I put it in either of the two footwells so it bathes all the electronics above it in warm air, then actually heats the entire cabin up a few degrees. This is just enough to eliminate any condensation, and on only 70 watts. 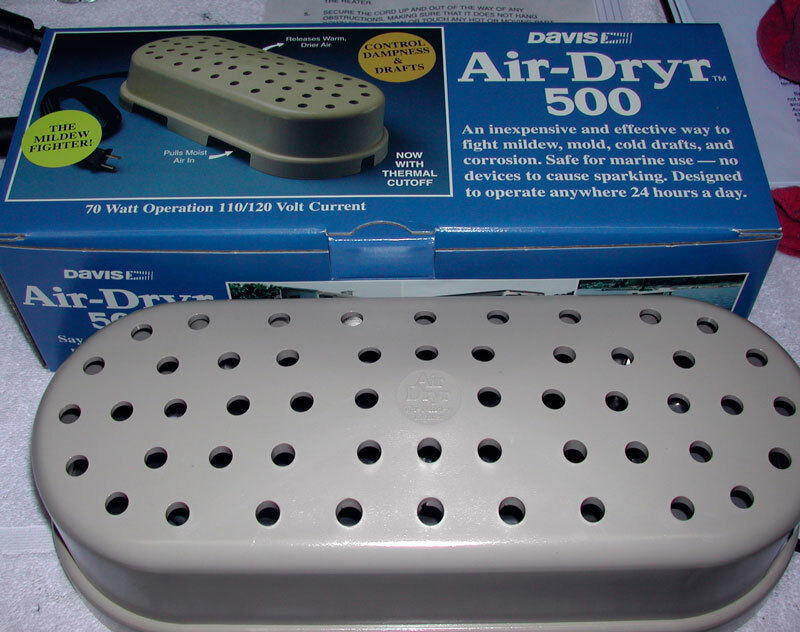 Air-Drys are available in the RV (the motorhome type) department of most auto supply places for around $50. • Sump heater pad — There are lots of ways to keep oil sumps and cylinders warm as well as various pre-heat devices and methods. Again, we don't have too many below freezing days so a heavy duty solution like you might need in an unheated Minnesota hangar really isn't needed. Also, since many of the aviation-specific heating methods apply quite a bit of heat there is some danger of "coking" or overheating and damaging your oil. My largest winter concern is condensation and rust inside the engine, then to a lesser extent starting the engine on cold mornings. For longest engine life the experts all recommend flying our plane weekly. Well, that just isn't real here in the great Northest. I confess, due to weather and life's scheduling conflicts (work) I can many times a winter go 3-4 weeks between flights. Regarding cold starts, even though the high for the day might be 45°, the night time temps will be in the 30s which is the temp of the engine in the morning after cold soaking all night. My intent therefore is not to keep things at 70 degrees, rather to keep the oil maybe 15-20° above ambinent. That would take it from 30° to 50° which is much easier on the engine. If the oil is a bit warmer than ambient then thermal conductivity will raise the temp of the metal parts a few degrees also — every bit helps. After investigating the various aviation-specific sump and cylinder heaters I became concerned about oil damage due to hot spots. Most of them consume a fair amount of juice also, usually in the 150-300w range, not to mention starting around $150 and going up from there. 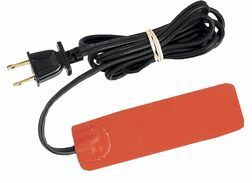 Then I discovered that NAPA has a line of generic self-adhesive pad heaters in wattages ranging from 25 to 200w. Aha, perfect! Not wanting to worry about oil coking I chose the 50w version p/n BK 7451146. The cost was $22 and if your local NAPA store doesn't stock them they can be purchased at www.napaonline.com. Of course you can't just turn on your engine monitor and check the at-rest oil temp because the sensor is way up on the accessory housing, but if you observe oil temp immediately on starting as the oil in the sump circulates you can get a handle on it's initial temp. The 50w heater seems to keep about 10° above ambient. Not a lot, but enough to keep moisture lower and ease starting just a bit. In all, these techniques make winters in the Northwest quite managable, and both the cost and energy consumption seem reasonable to me. Over the long run I'd bet this will lengthen engine life also by minimizing condensation and corrosion inside the engine as well as speeding oil flow during those wear-inducing cold starts. If my plane could talk I'm sure it would thank me. N223RL Condition Inspection checklist (.doc) — print, use for inspection, keep completed hard copy in aircraft file.